Oh, friends!! This is a blog post that we are so thrilled to write! It’s SUCH a pleasure to officially introduce to you guys our incredible associate photographers. Over the years, we’ve met so many amazing couples who we are unable to serve on their wedding day because we are already booked or out of budget for their big day. Because of this, we decided it was time to expand our team, and the Eric & Jamie Associate Program was born! The E&J Associate Program allows us to serve these couples by offering bright, timeless wedding photography with more availability and at a lower price point, while providing the same E&J care and client experience! When couples work with an E&J associate photographer, a lead associate photographer and a second shooter capture the wedding and engagement sessions for our associate program couples, while we (Eric & Jamie!) personally handle all of the editing and post processing to deliver a final product as shown through our website and social media channels. We also handle the client experience to ensure each couple receives the same level of service! Our first associate photographer to join our team was Grace. She has become a treasured friend and part of our family! Initially, we were not sure how an associate photographer program would grow or how couples would respond to it, but after meeting Grace, we’re pretty sure her brides and grooms love her just as much as we do! Grace works so hard on behalf of our couples, and we are so grateful for her! Grace worked alongside us in 2017 and has been shooting her own weddings throughout 2018 like a rockstar! She is so talented with a beautiful servant’s heart, and we are so lucky to have her on the E&J team! When Grace isn’t photographing weddings like a boss, she’s taking care of precious newborns as a nurse in the neonatal ICU at St, Vincent’s hospital. A Russellville, Alabama native, Grace resides in Homewood and loves to travel, spend time with her husband, Jim, and their Weimaraner, Sir Francis Drake. Maggie is our most recent addition to the team. We’ve loved getting to know Maggie through Tuesday’s Together, a group of local creatives that we lead monthly, as well as through the general wedding industry. Before joining our team, Maggie had her own wedding photography business, Margaret Taylor Photography. It is a thriving business that captures beautiful moments, but after giving birth to her son, Maggie wanted to focus on children and families and step away from full-time wedding photography. Her experience and sweet personality make her a perfect fit, and we’re thrilled to have her on board! Maggie joined the Eric & Jamie Photography team in 2018 as an associate photographer, and we are so lucky to have her! 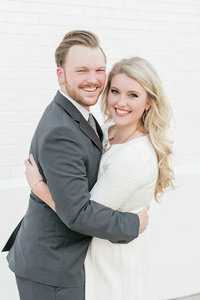 A graduate of UAB with a degree in marketing management, Maggie started her wedding photography business in 2015 and has since shot nearly 100 weddings. After giving birth to her beautiful baby boy, Jackson, Maggie realized her passion for motherhood and joined our team in order to spend more time with her family! We feel so blessed to have these two as a part of Eric & Jamie Photography and lucky that they put up with us on a day-to-day basis! More than that, though, we feel so lucky to have two wonderful girls on our team who we know will take great care of our couples! We hope you’ll follow along with their journeys and see all the beauty that they captured! Grace can be found on Instagram at @gracebedsole, and Maggie can be found at @maggiemccoy__! Keep an eye on the blog for more of their weddings, bridals and engagement sessions under the “Associate” category! And of course, check out their full portfolios here!